Yay!!! I am so excited to be ‘decking the halls’! I love Christmas and I love giving gifts. I am always trying to come up with cute and fun Christmas gift ideas for teachers and neighbors. I don’t want to spend a lot and I want them to be something that they can use. 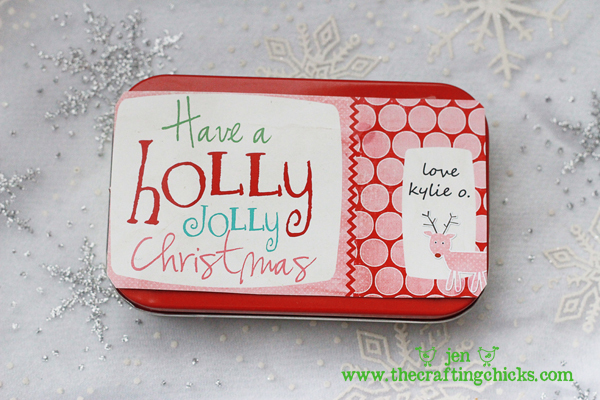 This year, I decided to make some little Christmas magnets and put them in some darling little tins for my kids teachers. I used Altoids tins. I found them at Smith’s grocery store. I had a really hard finding them for some reason. 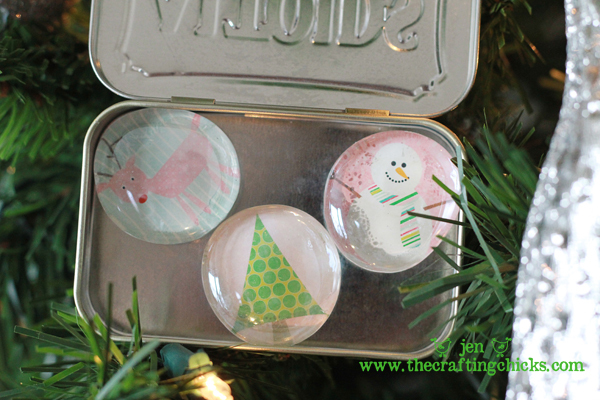 Altoids tins are the best, you can do so many fun things with them. I digiscrapped a little tag for the top and stuck it on with some glue dots. 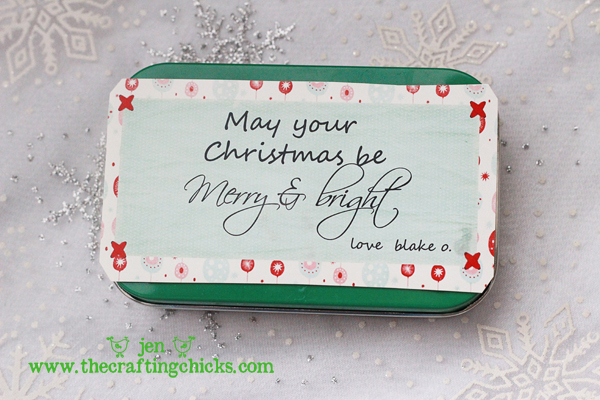 To make my tags, I used the December Holiday kit by Crystal Wilkerson. So, so easy and they turned out fabulous! 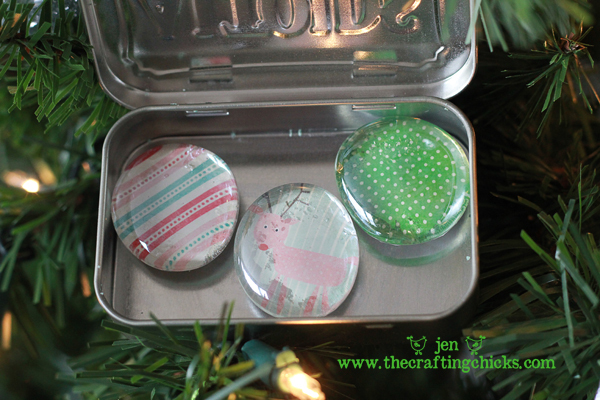 If you are new to making magnets, check out Jamie’s awesome magnet making tutorial. They are really easy and fun to make. 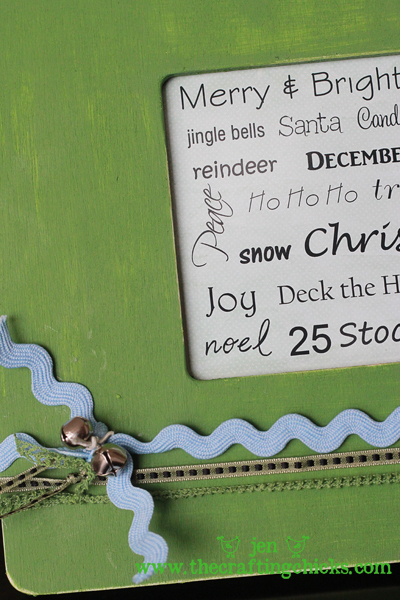 Another fun gift that I made this year is this framed mini Christmas word art. I got the frame at Micheals for $1.00. It is 8″x8″. I painted it and sanded it a little to make it look worn. 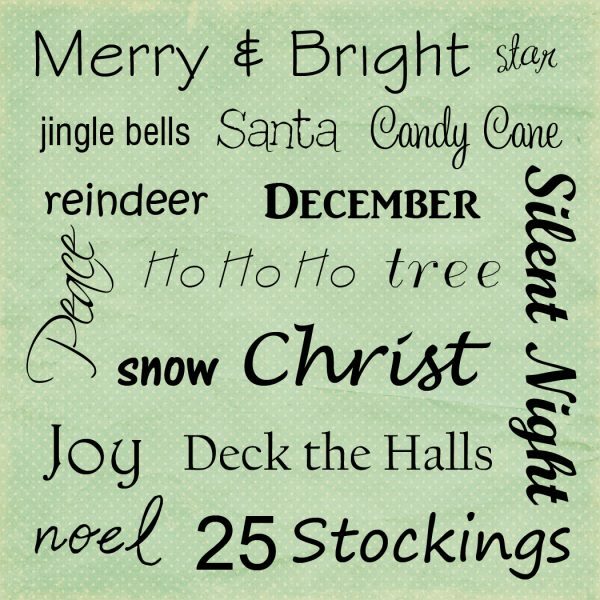 Then I added my simple mini Christmas word art that I made. The opening in the frame is 3.5″x3.5″, so that is what I sized my word art. Finally, I added some rick rack, some ribbon, and two little jingle bells. I loved it after I added the bells, it made it much more festive. As a little gift to you, here are the free downloads. There is one in green and one in blue. If you would like to make your own framed mini Christmas word art, right click on the image and save. Hi there! I love the magnets! Can you tell me where you purchased the clear stones? Can I find them at Joannes or Michaels? Thanks so much! 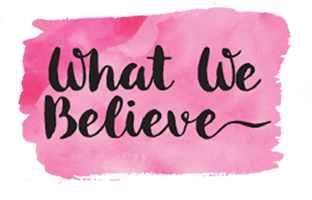 Thanks for reading crafting chicks! LOVE THEM JEN!!! I’m gonna have to make those magnets for sure!!! Too cute! My husband is a teacher so we always try to come up with something fun and USEFUL! Magnets are great because they are something one might use… you have no idea how many little trinkets he gets (he is a High school teacher) that go in the garbage. Gift cards are ALWAYS nice and appreciated. I am doing a 12 days of Christmas for each of my kids teachers. Each day a rhyme is attached to some useful goodie for the day… pencils, paperclips, candy canes, a clip board. You get the idea! Merry Christmas! I love the magnet idea! What a great idea for a teacher gift. Just a FYI – we use these clear stones to make neckalces with – super, super cute, easy, and cheap. Best of all-we get our bags from the Dollar Tree in their floral decor section! I love your site-I WILL be doing the magnets this year!!! Awesome idea! Hi! Love the magnets!! Can you use hot glue or dies the mod pog work best? Is that sold at Michaels craft store too?